Working with a board of directors is a huge responsibility and it required to choose a proper method to quit your job. The best way to quit the job is writing the resignation letter. Since the post on the board of directors is very important, it is important that you write a professional document. 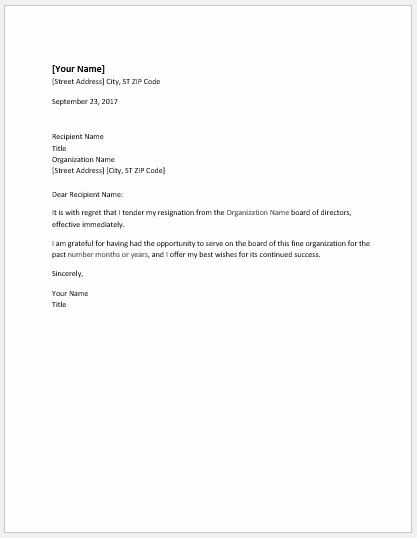 This type of resignation letter is used when you want to notify your organization about your decision of resignation. This makes it easy for the organization to find a replacement ahead of time. The letter should like any other professionally written resignation letter. It should be formatted in business letter format. Your contact details and signatures are the most important details to be added to the resignation letter. Clearly, give the date of the letter on which you will leave the job. Mentioning the date notifies the employer. State the benefits that you have got by working in the company and also state what you have learned from there so far. The resignation letter is also the best source of thanking your employer. No matter which type of circumstances you have around you, it is always important for you to stay positive throughout the letter. The letter should put a positive impression on the mind of the reader as you may need to interact with your employer in future. Offer the help to the employer in finishing the projects that you have been assigned. You should offer your services only if you have enough time to help the organization out. Since it is a professional document, it is necessary to keep it clear from all the grammatical and spellings mistakes. The mistakes in the letter represent the non-serious attitude of the sender. So, proofreading the letter, again and again, is always recommended. Following is given a sample resignation letter that is MS Word template. The letter is all in ready to use format with necessary letter body text. DOWNLOAD & customize with personal details and forward it the concerned authorities.